Spelling: Although the Blenheim passenger lists used “Thompson” most other records have “Thomson”. Based on the details in the Blenheim passenger list, Alexander Thomson was born around 1812 and his wife Helen around 1814. The Old Parish Register for Paisley Middle parish records that Alexander Thomson, lawful son of Alexander Thomson and Margaret Robertson, was born on 27 October 1812 and baptized on 15 November 1812. The Old Parish Register for Barony in Lanark, recorded the marriage on 15 May 1836 of Alexander Thomson, cotton spinner, Calton, and Helen Gollan, residing there. From the reports below, it appears that Alexander and Helen moved to Auckland shortly after the arrival of the Blenheim, and eventually settled on a farm in West Tamaki. The golden wedding of Mr and Mrs Alex. Thomson was celebrated on the evening of Thursday, the l0th inst., in the Presbyterian Church of Tamaki West. The little church was very artistically decorated for the occasion with evergreens, white and pink camellias, and other flowers of the season. About three hundred visitors were invited, and the church was literally crowded. An excellent repast was provided, chiefly by Mrs Thomson. Tables the whole length of the inside of the building were liberally spread with the daintiest viands. A number of ladies of Tamaki and neighbouring settlementa courteously waited at the table. After a bountiful tea, the Rev. John Macky took the cbair, supported by Mr and Mrs Thomson, Mr William Thorne, and immediate relations. The proceedings opened with the hymn “Praise Ye Jehovah” and prayer by Rev. R. F. Macnicol. The Chairman then made a few appropriate remarks upon the auspicious event, and called upon the Rev. Mr Steele to read apologies from well-wishers who were unavoidably absent, viz., the Revs. David Bruce, A. Carrick, T. M. King (St. John’s College), Mr James Bell, of Wairoa, and several others. The Chairman proceeded and expressed the pleasure he felt in the position which he had been called upon to occupy. He felt sure that in wishing Mr and Mrs Thomson much happiness on the event of their golden wedding day, every heart would respond to the prayer that their kind friends might be spared many years longer in their career of usefulness in connection with the locality and the church. He had known Mr and Mrs Thomson intimately ever since he was first introduced to them thirty three years ago. Having spoken at some length in eulogistic terms of the amiable qualities of his friends, he would call upon Mr Thomson to speak for himself and his aged partner. Mr Thomson, on rising, was greeted with prolonged applause, and proceeded to say that he had frequently said that if it should please God to spare him and Mrs Thomson to see fifty years of married life, he would have all Tamaki and half Auckland present to celebrate the happy event. He had not much to say to married guests upon the subject of matrimony, but he hoped they would all live to see their golden wedding, and be able to look back over half a century with as much retrospective pleasure and satisfaction as he looked over his past. He then gave some advice to unmarried men, enforcing the words of the highest authority, “It is not good for man to be alone,” the truth of which he and his partner had proved in their early colonial struggle by being united. They had found in their mutual endeavours that “two heads are better than one.” The speaker then gave a pleasing sketch of his life from tho time when he started with others from Glasgow, in 1840, by the good ship Blenheim for Wellington, and of his arrival in Auckland with Sir William Martin, the Hon. William Swainson, Mr Outhwaite, and others. He and his partner worked hard, and at length saved sufficient money to purohase Water Yett, Tamaki, the farm upon which he and Mrs Thomson had laboured 40 years. He now occupied the building which formed the first Presbyterian Church in the province. A preacher, still living in Scotland, characterised the church as a barn, and the pulpit a tea chest. He did not approve of the terms. The little church, however, had boen of real service to the people of the district, and the ministrations from that so-called “tea chest” had proved a blessing to many. Mr Thomson then sketched the history of the church and the Sunday school and Bible class, with which he had been closely connected, for the long term of forty-five years, concluding with several suggestions for practical work and general improvement. At Mr Thomson’s request, Rev. Mr Steele read the marriage lines, which showed that Alexander Thomson, bachelor, and Ellen Gollan, spinster, were married on the 2nd of June, 1836, by the Rev. John Edwards, in the Monteith Row Church, Glasgow. (Loud cheers.) Short congratulatory addresses were successively given by Rev. T. G. Carr, D. W. Runciman, G. E. Monro, K. F. Macnicol, Thomas Norrie and Mr Hunter. Between these brief speeches several sacred selections and songs ware sung. Mrs Kimpton, of Otahuhu, sang the old but very appropriate song, “Darby and Joan,” with telling effect. The same lady, with Miss Wallace, sang a duet, and subsequently the fine lyric entitled “Charity.” Miss Pulman sang “Too Late,” with pianoforte accompaniment. Mr James Wallace gave a recitation, “The Young Man Leaving Home,” with much elocutionary skill. Miss Lily Pulman then recited “The Golden Wedding Song,” written for the occasion by Mr John Blackman, which was received in a kindly spirit. This effusion was distinctly and clearly enunciated by the reciter. A splendid picture of the aged pair, photographed by Pulman, Shortland-street, was then exhibited to the audience, elegantly framed. The wedding cake was then cut by the bride with the silver knife and distributed to the assembled visitors. The cake was the gift of Mrs Carr and Messrs W and A, Thorne. The Rev. Mr Steele, on behalf of the company, expressed thanks to Mr and Mrs Thomson, to the ladies of the tea tables, and to all who had assisted in contributing to the entertainment, and the whole closed with the Benediction pronounced by the Chairman. His death registration shows that Alexander Thomson died on 3 August 1886 at St Andrews Church of Scotland. He was a farmer of 73, the son of Alexander Thomson, stonemason, and Margaret Robertson, was born in Paisley, had been in New Zealand for 46 years, and had been married in Glasgow at 25 to Helen Gollan. There were no living children. The cause of death was apoplexy. SUDDEN DEATH AT THE MEETING OF THE AUCKLAND PRESBYTERY. At the meeting of the Auckland Presbytery, yesterday afternoon, a very sad event occurred. After the Presbytery had concluded the business before it, Mr. Alexander Thomson, an elder residing at Panmure, and representing the church at West Tamaki, rose, having taken no part in the business previously, and asked that the Presbytery should proceed then to inquire whether the collections for the foreign missions appointed by the Assembly had been made by the several congregations. To this the Presbytery at once agreed, out of respect to Mr. Thomson, and was about to carry nut the request when he was observed to have fallen back in his chair in what appeared to be a fainting fit. He was immediately unconscious and, a pallor coming over his features, it became evident that death was at hand. The Moderator and the other members near him did all they could to ease his position, but the heart had ceased its pulsations. Dr. Kenderdine was present in a few minutes, and pronounced life extinct, the cause being apoplexy. After some time had elapsed, and the body had been removed into the vestry, the Presbytery met for a few minutes, and Mr. Carrick, at the Moderator’s request, engaged in prayer, the Presbytery adjourning its meeting until to-day, at ten a.m. The deceased gentleman was 75 years of age, and on the 10th of June last celebrated his golden wedding. It appears that about two years ago he received injury in the chest from the kick of a horse, which at the time caused a very dangerous illness. Since his recovery he had been subject to fainting fits, and yesterday morning, when coming to the Presbytery meeting, he complained of not feeling well. Mr. Thomson came to Wellington in 1840, and after remaining there for about a year he came to Auckland, where he has been ever since, on a farm at the Tamaki. He leaves a widow, but no children. Deceased was an active member of the Presbyterian Church, and took a great interest in the Sunday schools and in other departments of Church work. He was kindly, frank, and hospitable. Mr Alexander Thomson, a very old settler of Tamaki West, and an elder of the Presbyterian Church, died on Tuesday, August 3, at the sitting of the Presbytery in St. Andrew’s Church. Mr Thomson came into town early and transacted a considerable amount of business,and while dining at a friend’s house in Shortland street said he feared he had overdone it. He felt somewhat weary, and his breathing was difficult. He left for the meeting of Presbytery at St. Andrew’s, and was speaking upon the subject of the collections of the churches for Foreign Missions, when suddenly he staggered and fell back unconscious upon the seat. A pallor immediately overspread his features, and it was evident that the hand of death «as upon him. Mr Lennox ran for Dr. Kenderdine, and that gentleman, on arrival, pronounced life extinct. The cause of his death was apoplexy. The body was removed at the moderator’s request into the vestry, and subsequently was placed in a shell and removed by Mr Wm. Thorne, solicitor, a nephew of deceased, to Mr Thomson’s late residence. Deceased was born in Glasgow in I811, so that he had reached his 75th year. In early life Mr Thomson was a cotton weaver in his native city, and was of a quiet and religious disposition. He was married June 2, 1836, to Ellen Gollan, in Glasgow, and four years from that auspicious event, in 1840, the young pair left Glasgow in the good ship Blenheim, for the city of Wellington, and after staying there for some months, sailed for Auckland, and filled in this city and suburbs several positions of trust. Mr Thomson and his partner settled on a small farm at West Tamaki, known as Water Yett, where they lived for more than 40 years. Mr Thomson told the story of his colonial struggles with graphic force on the occasion of the celebration of his “golden wedding” in June last. The funeral of the deceased was very largely attended, several hundred persons joining in the procession. A short service at the house was conducted by the Rev. John Macky, sen., minister of the united charge of Otahuhu, Tamaki, and Howick, and the Rev. T. G. Carr, Wesleyan minister (nephew of the deceased by marriage). On arriving at the cemetery the coffin was carried into St. Enoch’s Church, where service was performed by the Revs. J. Macky and T. Norrie, the former giving an appropriate address, in which he spoke of the Christian character of the deceased, and the good services he had rendered in the district for many years, especially to the younger members of the resident families, and concluded by urging all to follow his example. The Rev. D. Bruce and Rev. Mr Steele conducted the service at the grave, near the church. 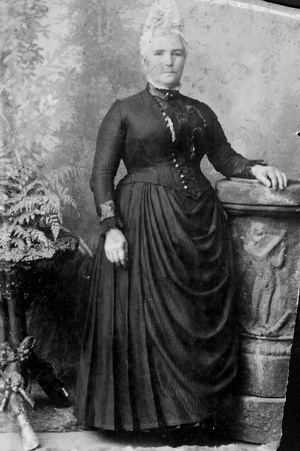 Helen Thomson, widow of 84, died on 14 May 1898, at Pakuranga. No details of her parents were included in death registration, although it was noted that her father was a schoolteacher. Helen was born in Glasgow, and had been in New Zealand for 58 years. She was married in Glasgow at 18 to Alexander Thomson. There were no living children. The cause of death was senile decay. The reports above refer to a nephew, William Thorne, solicitor, and nephew by marriage, the Rev T G Carr. 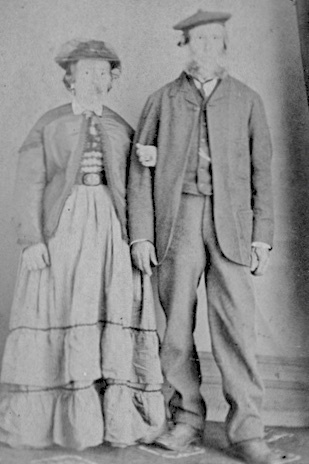 William Thorne and Matilda Carr were the children of William Thorne and Mary Gollan, Helen’s sister, who were married in 1846. Mary Gollan emigrated to New Zealand on the Duchess of Argyle which sailed from Greenock to Auckland in 1842. She was 30. There was another family of Gollans from Glasgow on this ship, headed by James Gollan, 33, and including his wife Abigail and several children. In fact, “John Sinclair” was John McHutcheson, Eliza’s brother, and it is likely he travelled as one of their children because the cost of his travel would then be covered by the the purchase of a £100 land order from the New Zealand Company by Francis Sinclair. Note on Spelling: The use of “McHutchison” or “McHutcheson” or “Hutcheson” has been determined by the source material, since a variety of spellings have been used at different times. An interesting perspective on this family can be found in “The Sinclairs of Pigeon Bay, or ‘The Prehistory of the Robinsons of Ni’ihau’: An essay in historiography, or ‘tales their mother told them'” contained in “Watriama and Co: Further Pacific Island Portraits” by Hugh Laracy, ANU Press, 2013. Francis Sinclair was born around 1797, the son of George Sinclair, a master mariner of Prestonpans. Elizabeth McHutchison was born on 23 April 1800 and baptized on 27 April 1800. Her parents were James McHutchison and Jean Robertson, and the record was in the Old Parish Register for Renfrew in the county of Renfrew. The Old Parish Register for Gorbals, Lanark, recorded that Francis Sinclair and Elizabeth McHutchison, both in Kingston, were married by the Reverend Mr Ritchie in Gorbals on 13 January 1824. On arrival in New Zealand, Francis got to work immediately by buying a boat and shipping timber from Petone to Wellington. Within a few months he moved the family to Wanganui, where he had purchased an option on land through the New Zealand Company. However, there were going to be considerable delays before the land could be settled and they returned to Petone. There Francis built a boat, the Richmond which he used as a cargo vessel and to relocate his family and that of Ebenezer Hay to Banks Peninsular in the South Island, squatting on land in Pigeon Bay. In building the vessel, Francis Sinclair, his sons and John McHutcheson did all of the work themselves, except for the iron work which was done by a blacksmith named Fraser, another Blenheim passenger. The Richmond was sold to pay for cattle, but Francis built another ship, the Sisters, which he used for trading between Banks Peninsular and Wellington. This vessel was sold in 1845 to purchase land at Pigeon Bay from the Nanto-Bordelaise Company. By the Mana we learn that Mr Sinclair, of Pigeon Bay, left that place on the 10th of May last in a small cutter of about 10 tons, bound for this port. She has never been heard of since, and there is too much reason to fear that the unfortunate vessel foundered the following day in the heavy south-east gale, which our readers may remember came on very suddenly. Mr Sinclair was accompanied by his two sons, a nephew, and Mr M’Lennan, a shoemaker of Akaroa. He has left a widow and several children to lament his untimely fate. This report appears to be not quite correct in the identities of the missing. Elizabeth moved to Wellington for a couple of years, but in 1849 returned to Pigeon Bay, and on their land at Sinclair Bay built a homestead called “Craigforth”. The family prospered there for a number of years but in 1863 they decided to make a fresh start elsewhere. Thomas Gay, who married Jane Sinclair, purchased the barque Bessie and the family set off, first to British Columbia, and then to Hawaii where they purchased the island of Ni’ihau from King Kamehameha V. Ni’ihau had good grazing land for sheep and the family also bought land on the neighbouring island of Kauai where they grew sugar cane. The Old Parish Register for Glasgow records that Francis Sinclair, Excise Officer, and Elizabeth McHutcheson, had a lawful son George born on 5 November 1824. Witnesses were James McHutcheson and Robert Miller. George Sinclair emigrated to New Zealand on the Blenheim in 1840 and worked with his father on his various enterprises until they were lost at sea in 1846. According to the Old Parish Register for Kinloss in Morayshire, James McHutcheson Sinclair, lawful son to Francis Sinclair, Excise officer, and Elizabeth McHutcheson, in Findhorn, was born on 23 June and baptized on 25 July 1826. Witnesses were William Duston, Excise officer, East Grange, and George Gill, Findhorn. The Old Parish Register for Glasgow records the birth to Francis Sinclair, Officer of Excise, and Elizabeth McHutcheson, of a lawful daughter, Jane Robertson, born on 22 March 1829. Witnesses were James Calder and John Wylie. Thomas Gay was a widower, whose first wife was Bridget Burke, who died in Tasmania in 1847. They had two sons, Thomas Gay and James Walter Gay. James Walter Gay, was born on 19 November 1841 in Tasmania, and died on 28 May 1893 in Hawaii. The Gays moved to Hawaii with the rest of the family, and Captain Thomas Gay continued to trade with New Zealand and Australia. In 1864 Thomas Gay and his brother William, his first mate, were tried in Auckland for assaulting an insubordinate seaman, and were sentenced to six months’ imprisonment but were released early. Thomas Gay, however, died in New South Wales, Australia, on 9 February 1865 of pneumonia. George Gay, born in 1850. Francis Gay, born in 1852. Eliza Gay, born in 1856. Annie Gay, born in 1859. Charles Gay, born in 1862. Alice Gay, born in 1865. Jane (Sinclair) Gay died in 1922. The Old Parish Register for Stirling records that Helen McHutcheson Sinclair, daughter of Francis Sinclair, Officer of Excise, and Elizabeth McHutcheson, was born on 29 May and baptized on 26 June 1831 by the Reverend B Bailey. Witnesses were James Brown and William McHutcheson. Helen was on board the Blenheim with her family on the voyage to New Zealand in 1840, and moved with them to Pigeon Bay. 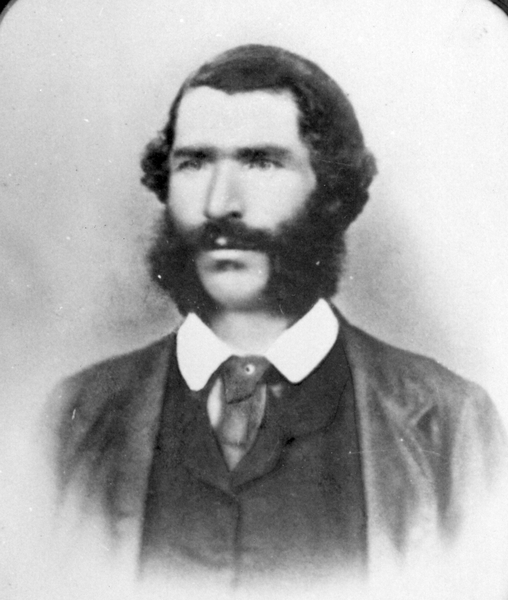 Charles Robinson was Akaroa’s first magistrate from 1840 to 1845, and purchased land there from the Nanto-Bordelaise Company. He is said to have raised the British flag in Akaroa in 1840 to thwart French efforts to claim the South Island. Charles and Helen had a son, Aubrey, born on 17 October 1853. However, in 1855 Helen parted from her husband, apparently because he was violent to her, and she and Aubrey moved with the family to Hawaii. Charles Barrington Robinson died at 15 Hermitage Road, Richmond, Surrey, England, on 28 December 1899. The date of Helen’s death has not yet been established. Aubrey Robinson married his cousin Alice Gay in 1885, having travelled in Europe and Asia, and returned to Hawaii in 1883 to manage the family estates with his cousin and brother-in-law Francis Gay. They established the company of Gay & Robinson. Aubrey died in Hawaii in 1936. The Old Parish Register for Stirling records that Francis, son of Francis Sinclair, Officer of Excise, and Elizabeth McHutchison, was born on 12 January 1834 and baptized by the Reverend Alexander Marshall of Friar’s Wynd Chapel. Witnesses were John Paton and George Harvey. After emigrating to New Zealand with his family, and living with his mother at “Craigforth” following his father’s death, Francis Sinclair and his uncle John McHutchison took up a sheep farm in the Mackenzie Country, but were unable to make a go of it, and returned to Banks Peninsular. Francis then moved with his mother and siblings to Hawaii, returning to New Zealand in 1866 to marry his cousin Isabella. The Otago Witness of 12 December 1900, in a piece entitled “In Starry Byways” set out some biographical details of Francis Sinclair, quotes from his poems, and suggests that he may claim to be New Zealand’s “first poet”. In 1881 Francis bought a property in Epsom, and in 1883 passed management of the family’s Hawaiian estates to his nephews Aubrey Robinson and Francis Gay. In 1885 he was in London overseeing the printing of Isabella’s book Indigenous Flowers of the Hawaiian Islands, and in 1891 sold his property on Ni’ihau to his sisters, Jane Gay and Helen Robinson, and his nephew Aubrey Robinson. When his mother died in 1892 he was living in California, but eventually moved to England. Following Isabella’s death around 1896 Francis married her widowed sister Williamina Shirrifs. He settled in London and published more poems, essays and short stories. Francis Sinclair died on the island of Jersey on 22 July 1916 aged 83. According to the Old Parish Register for Stirling, Ann McHutchison Sinclair daughter of Francis Sinclair, Excise, and Elizabeth McHutchison, was born on 7 March and baptized on 22 March 1839 by the Reverend Mr Marshall. Witnesses were Andrew Beath and James Mitchell. Ann, aged 1, was part of the family party that emigrated to New Zealand on the Blenheim in 1840, lived at Pigeon Bay, and then moved to Hawaii in 1863. Valdemar Knudsen was born in Norway in 1819, and travelled to North America where he was a publisher in New York and a merchant during the California gold rush. He then moved to Hawaii where he managed a plantation before leasing land at Waiawa on West Kauai. Valdemar Knudsen died in Honolulu in 1898. Ann and Valdemar had five children – Ida, Augustus, Maud, Eric and Arthur – and lived in Waiawa, and Halemanu in Kokee when Waiawa was too hot and dry. Ann (Sinclair) Knudsen died in 1922 at Kauai, Hawaii, aged 83. The Old Parish Register for Glasgow records that James McHutcheson, manufacturer, and Jean Robertson, had a lawful son John, born on 6 October 1816. Witnesses were Thomas Mitchell and Septimus Ellis. John McHutcheson travelled on the Blenheim with his sister and her family, but under the name of “John Sinclair” and aged 20 (in fact he was 24), but reverted to his real name on arrival. John McHutcheson worked with his brother-in-law in their various enterprises, and accompanied the family initally to Wanganui, back to Petone, then to Banks Peninsular. In 1856, with his nephew Francis, John took up a run of 10,000 acres in the Mackenzie Country, but they lasted there only two years because of the difficulties in working it effectively. It appears that at some point “John McHutcheson” became “John Mack Hutcheson”. John Mack Hutcheson married Mary Gorrie on 4 July 1856. In 1873, John Mack Hutcheson was elected Mayor of Blenheim. Wellington, January 27: Mr John Mack Hutcheson, aged 82 years, a very old colonist and one of the best known and esteemed settlers in Marlborough, died at noon to-day. The late Mr Hutcheson was well known in Canterbury. Having come out to New Zealand from Glasgow in 1840, he settled on the Hutt river, Wellington, and though he removed to Wanganui, he soon returned to the Hutt. In 1843, however, he settled at Pigeon Bay, Akaroa. He went to England in 1848, and while there was interested, with Captain Cargill, in securing the despatch of the first immigrants to Otago, in the ships John Wickliffe and Philip Laing. On his return to the colony he settled in Canterbury, and remained in this district till 1864, when he left for Nelson, where he and Mr McDonald re-opened a branch of the Union Bank. Later on he took up a cattle run in the Mackenzie Country, and it is stated that he was the first man, after Mackenzie, to wander over those plains. His nearest neighbour at this time was sixty miles away, and the loneliness of the life did not offer many attractions to Mr Hutcheson, who sold his property, the buyer, it is said, being a Mr Gladstone, a nephew of the late Prime Minister of England. Mr Hutcheson went into business in Blenheim in 1859, and resided in Marlborough ever since. John Hutcheson, born in 1859, died in 1907. Francis Sinclair Hutcheson, born in 1863, died in 1881. David Gorrie Hutcheson, born in 1868, died in 1930. Richard Morley Hutcheson, born in 1871, died in 1877. Helen Eadie Hutcheson, born in 1873, died in 1941, married Malcolm Bird in 1910. Jeanette Robinson Hutcheson, born in 1877 died in 1889. Ronald Oliphant Hutcheson, born in 1881, died in 1951, married Cecilia Jane Jacobsen in 1920. William Hutcheson, born in 1882, died in 1904. John’s brother William McHutcheson also emigrated to New Zealand in 1862, having worked for the Inland Revenue in Scotland before moving to Christchurch and then Oamaru. William died in Oamaru in October 1905, aged 95. “Watriama and Co: Further Pacific Island Portraits” by Hugh Laracy, ANU Press, 2013.